Thank you for your interest in touring the University of Miami’s Rosenstiel School of Marine & Atmospheric Science. As one of the world’s premier marine and atmospheric research institutions we offer dynamic interdisciplinary academics, and are dedicated to helping communities to better understand our planet. Prospective undergraduate students should first visit UM’s main Coral Gables campus, where they will take the majority of their classes. 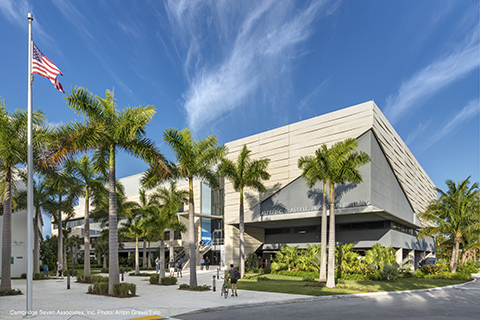 A general tour of the main Coral Gables campus, offered by the Office of Undergraduate Admissions can be booked online by clicking here. *Please note that prospective undergraduates interested in registering for the Rosenstiel School Guided Tour must also attend the Information Session held by the Undergraduate Marine and Atmospheric Science Program Office. All three tours can be scheduled for the same day. If you’d like to attend all three tours in one day, we recommend registering for the 10am UM Admissions Tour.